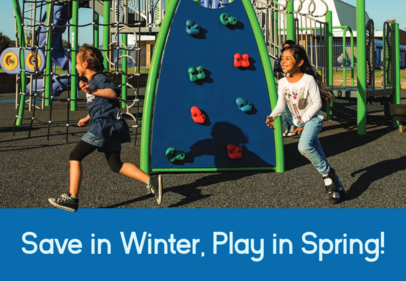 Winter Playground Savings! Save up to 35% on New Play Systems. Select playground equipment is on sale through March 29! Save up to 35% on GameTime play systems including the durable high capacity PowerScape systems, affordable and fun PrimeTime units, visually inspiring IONiX designs and activity promoting Xscape products. View eligible systems here and use the form below to contact Cunningham Recreation to receive a quote on a new system for your organization!